Mictor breakout adapter, splitters are designed in 4 layer PCB for improved signal integrity meeting highest performance at affordable price. 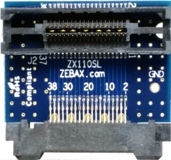 Mictor breakout adapters are offered in 38 pins (19pins x 2 rows ) connectors meeting logic analyzer and scope flying probe applications. 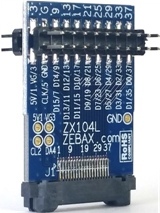 Zebax Mictor breakout adapters ( test boards ) mate with any height Mictor connectors. The 38 Mictor breakout adaptors are designed to meet Keysight ( Agilent ) and Tektronix Logic Analyzer requirement. 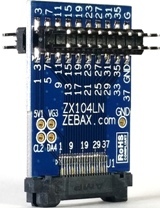 Mictor extender boards enabling access to 19x2rows → 38 pins - designed in 4 layers PCB with 50 Ω trace impedance. Mates with any height 38 pins Mictor Socket ( Receptacle ). 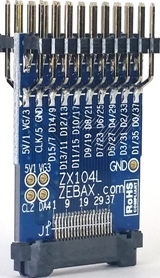 Mictor breakout adapter enabling access to 19x2rows → 38 pins - Designed in 4 layers PCB with 50 Ω trace impedance with GND test point. 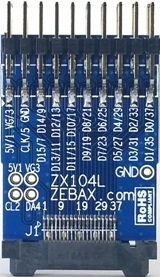 The GND test point is connected to the 2 inner layer GND planes. ZX104WH has onboard Mictor Receptacle, mating with any height 38 pins Mictor Plug, or cable assembly with Mictor Plug. 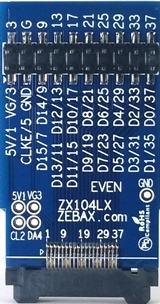 Improved design of E5346-63201 using 4 layers PCB design with 50 Ω trace impedance. - Mates with any height 38 pins Mictor Socket ( Receptacle ). - Standard 0.1” (2.54mm) pitch header. 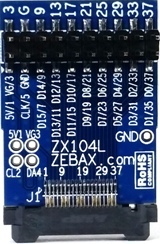 - Dedicated GND test point, accessing Mictor GND blade as well as module's GND plane. 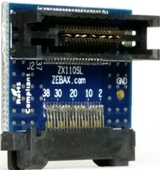 - ZX104LNR has onboard Mictor Receptacle, mating with any height 38 pins Mictor Plug. 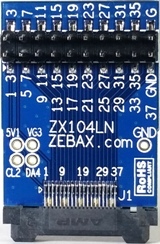 - Identical to ZX104LN, except silkscreen has both D0 .. D15 and the Mictor pin numbers. - Identical to ZX104L ZX104LN but taller. - Silkscreen has both D0 .. D15 and the Mictor pin numbers. Mictor breakout adapter 19x2rows → 38 pins no Via + GND test point + using 0.15” ( 3.8mm ) pitch center header. - Mictor pins 1 and 2 are one differential pair, pins 3-4, 5-6 .. are subsequent differential pairs. 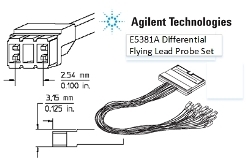 - Designed to be used with E5381A differential probe or any other differential or general single channel scope probe. - Ideal for signal characterization, signal analysis. - Mictor pins 1 and 3 are one differential pair, pins 2-4 5-7 6-8 9-11 .. are subsequent differential pairs. 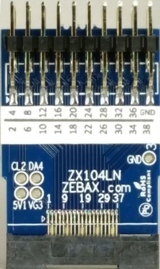 Mictor breakout adapter 19x2rows → 38 pins no Via + GND test point + using 0.10” ( 2.54mm ) pitch center header. - 50 Ohms trace impedance, using 4 layers PCB design. - Ideal for signal characterization, signal analysis, bringup and debug. - Mates with any height 38 pins Mictor Receptacle and Plug. - Includes 1 Mictor Plug interfacing with host. - Includes 2 Mictor Receptacles, one interfacing with target system and one interfacing with Logic Analyzer probe or anothere system, B2B interface via cable assembly. - Includes 0.1" (2.54mm) pitch headers - 50 Ohms trace impedance, using 4 layers PCB design. - Desinged for applications using Keysight Tektronix or similar logic analyzer or scope probes. 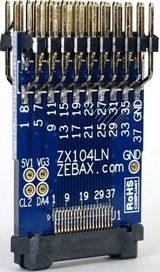 Mictor breakout adapter 19x2rows → 38 pins using 4 layers PCB design with 50 Ohms trace impedance. - Includes 1 Mictor Plug interfacing with host. - Includes 3 Mictor Receptacles, interfacing with target system and/or Logic Analyzer probe or another system, B2B interface via cable assembly. 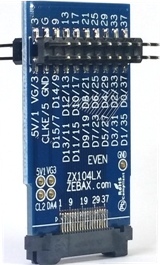 - Ideal for emulation, signal analysis, bringup and debug. 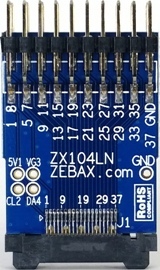 - Includes 1 Mictor Plug interfacing with host. - Includes 0.1" (2.54mm) pitch headers - Mates with any height 38 pins Mictor Receptacle.